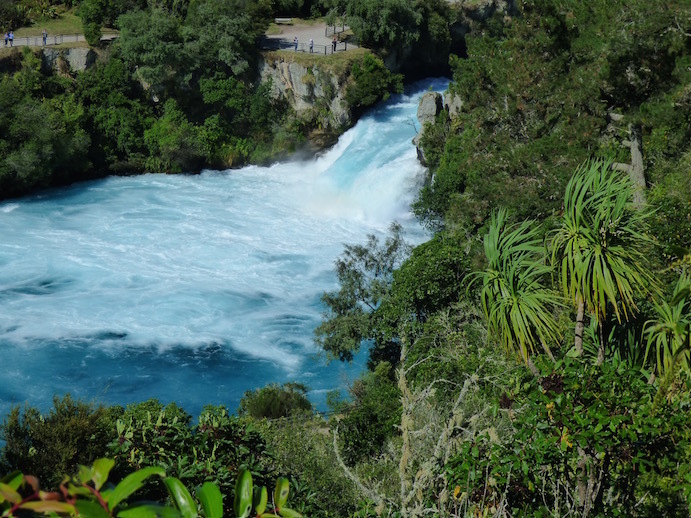 Galley Wench Tales: NZ’s Most Visited Attraction Outdoors? the falls so you can hear the mighty roar of its water. 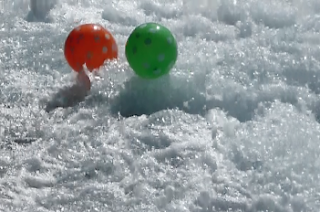 Not edited; water's really this aqua. Taupo, New Zealand. It’s free. The access is quick and easy with two sizeable parking lots, pleasant walkways and several photo-op-worthy viewing platforms. Part of the Waikato River, Huka Falls is only a few hundred meters from Lake Taupo, in the heart of New Zealand’s popular thermal country. on the bridge, where the photo was taken from. Most of all, it’s not every day you get to see brilliant aqua water spiked with crisp white foam thundering down a small canyon at 220,000 liters (over 58,000 gallons) a second. That may be small potatoes compared to the highest volume waterfall of all, Boyoma Falls, formerly known as Stanley Falls, which pumps out over 17 million liters per second. Then again, how many of us plan to visit the Democratic Republic of the Congo? 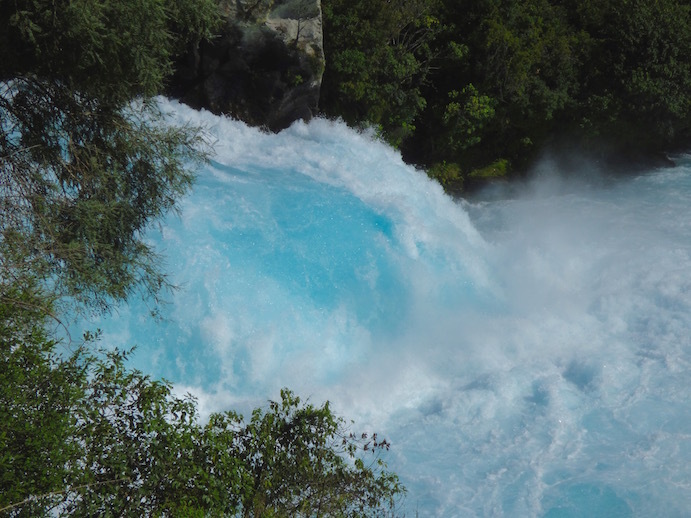 Still, to put Huka Falls flow into perspective, that’s enough to fill one Olympic sized swimming pool in 11 seconds, according to a Lake Taupo website. bridge crossing over the Waikato River. No wonder the company that manages Huka Falls flow for hydropower is called Mighty River Power! Mighty River Power provides between 8-9% of New Zealand’s power. I agree. 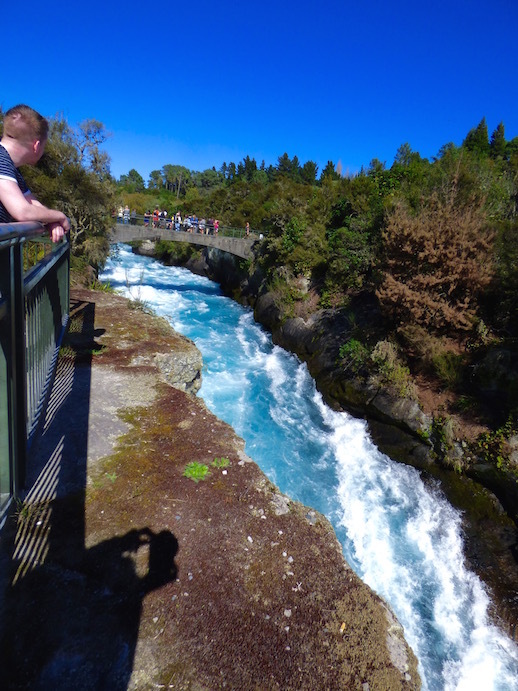 While Huka Falls isn’t the reason to visit New Zealand, if you’re in the Lake Taupo area, it’s a darn fine way to spend a half hour and walk away with a great sense of satisfaction. 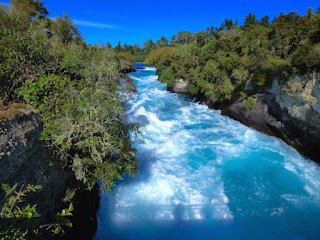 on the Waikato River, near Taupo. We're still on a pole mooring in Whangarei's Town Basin Marina (S35.43.414 E174.19.539). Weather and to-dos-done permitting, we'll likely leave Whangarei as early as April 28th, 2016, for checkout then to Fiji. Last year, between December 2014 and November 2015 we sailed from Florida USA to New Zealand, over 10,000 miles. Current plan's to resume cruising by this May. First stop's Fiji, ~1170 nm, which will take us about two weeks to get to once we clear New Zealand customs and set sail. We plan to sell our boat in Australia, after completing another 4,000 or so miles this cruising season. Then, it's back to work, somewhere.